Shihan Van Walleghem started his training under Shihan Max Gebhardt, who brought Kyokushin to Belgium together with Shihan Jon Bluming. Later Shihan Van Walleghem took over his dojo and studied under various Shihan in Holland. In this period Shihan Van Walleghem trained about 6 days a week for several hours, and attended the famous Holland Papendael Summer School led by Shihan Loek Hollander 8 times. Shihan Hollander graded him nidan. In this period Shihan Marc also participated in several knockdown tournaments. 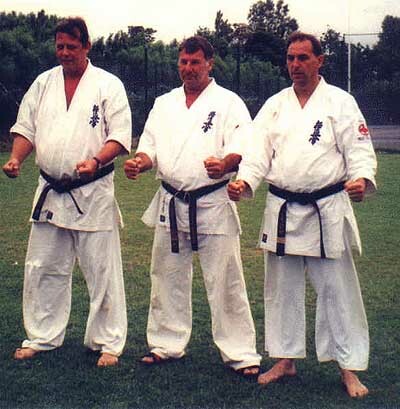 Known for his excellent technique and training qualities Shihan Van Walleghem became technical director of the Belgian Kyokushin Karate Organisation and was graded sandan by Shihan Jeff Whybrow. As a preparation for this grading Shihan Van Walleghem created a kata which contains all Kyokushin techniques in a logical way. The name of the kata is "gratitude". For his yondan grading in 1997 Shihan Marc had to perform a public test of all Kyokushin techniques and Kata observed by Kancho Matsushima himself and many Shihan from Japan and abroad including Shihan John Taylor. In 1999 Shihan Marc was graded godan by Kancho Matsushima together with Shihan Jozsef Borza at the Mas Oyama Memorial (Canada). Most of the Belgian Kyokushin Yudansha trained under his leadership for preparation for their grading; always succesfully ! Everyone knows Shihan Van Walleghem as Belgium's most succesfull coach. His students Koen Spitaels and Raoul Strikker both participated twice at the World Tournament. Raoul became 11th on the 5th WT. More recently his girl-friend Peggy Groesser seems to be the comming champ as winner of the Mas Oyama Memorial tournament in Cannada 1999 and 2000, the Maine Open Tournament 1999 and her third place on the European Championships 1999.